I wanted to title this post, Podía vivir aquí!, I could live here! I have been saying this to myself all day long for the last four days. It is like any relationships. First date; mm, had fun but not sure it is going anywhere. Okay, let’s go out again. Little bit more intrigued, more drawn in. Let’s try a third time; after all, I am going to be in your area for a while, waiting for my plane home. Yeh, the interest is growing. Fourth time, hey we went to a futbol game together; it was magical; this could be become serious. And the fifth date, the sparks start to fly. I’m in love. And to think that I arrived here a few days ago, tired of travelling, wondering why I booked for three weeks, and quite seriously, ready to come home. And now I am babbling to myself as I turn every corner, as I wander down the next street, as I bumped into new marvels, I could live here, podía vivir aquí. This post was going to be a winnowing down of photos to try to give you a sense of this city, a monumental city without any history of empire, of conquering other people (yes, they ruled Italy for a few centuries a long time ago, but every other country ruled Italy at least for a while), a city for the citizens, an absolute delight in every corner that I have seen. Hey, Rob Ford. They have a great subway system, lines crisscrossing in every direction. Good. But do you know what else they have? 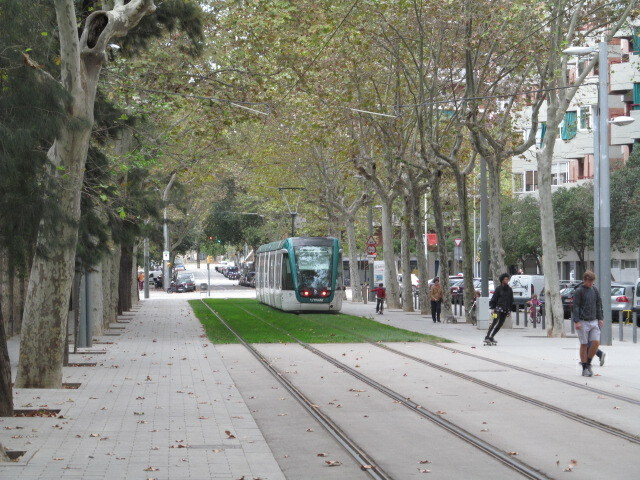 LRTs, 40-50 kilometres of them, 6 lines, stretching out into the suburbs where the population isn’t as dense. I headed out on one yesterday, a great way to see the real city, far from the tourist shops and attractions. Today I went in the other direction and after four stops I had to jump off. This is a city with vision, not just to attract tourists and business (like the Olympics), but vision for their citizens. Where I had jumped off has been a flea market of some sort or others since the 14th century. A few years ago, the city decided to rebuild it. I could believe how playfully delightful it was. I only hope my photos can capture some of it. It is called in Catalan, Bon Encants. The root, encantador, means charming. 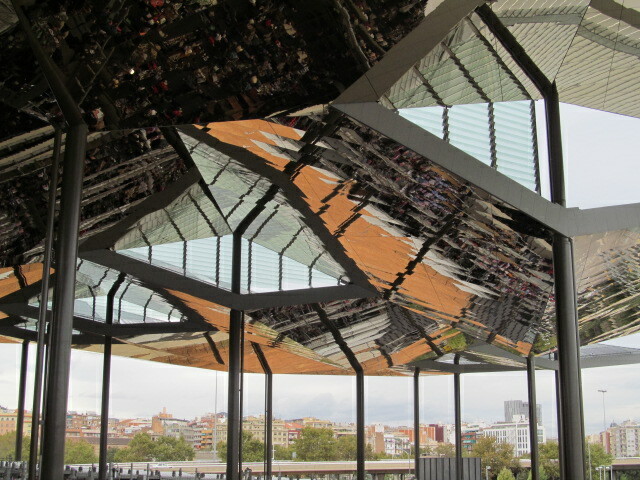 I am heading into the flea market; what you are looking at is a totally imaginative roof of mirrors,set high above the stalls, with mirror faces set at angles to each other. I cannot imagine how brilliant it must be be in full sunshine. I want to drive you mad with desire to jump on a plane. 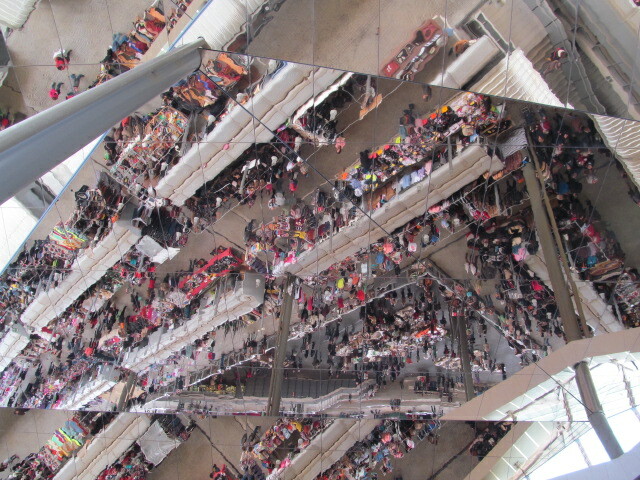 This is a photo of the main floor of the stalls, but with my camera aimed at the ceiling. You can see where the mirrors are angled. This will help you get with your bearings. 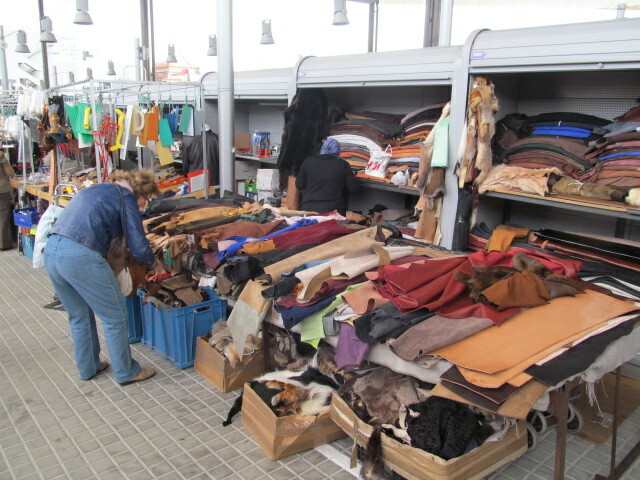 Stalls of all kinds, clothing, hardware, antiques, plumbing (some stalls are permanent), books, knickknacks, whatever, including pieces of leather. 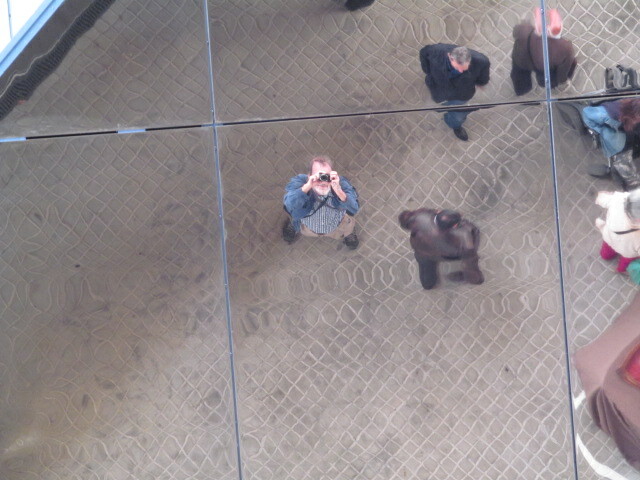 I couldn’t resist this photo, reflected from on high! But with my zoom; without it, you would not have been able to tell that it is me. Of course, this is Spain; around the periphery are bars and places to grab a snack, some tapas, a glass of tinto, whatever. Another one to disrorient you; it is taken at the edge. 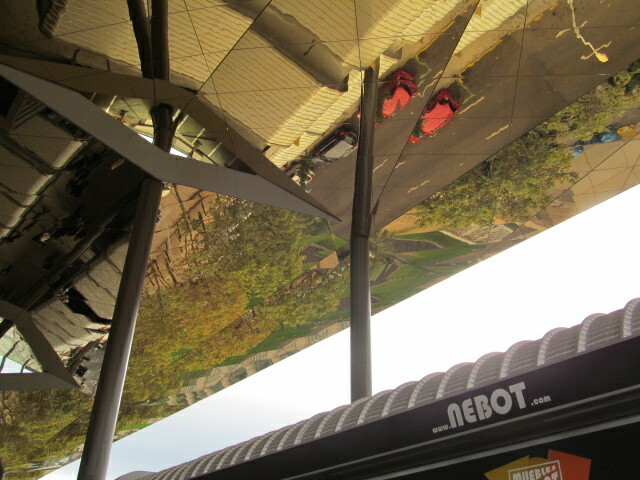 You see at the bottom of the photo the roofs of some of the permanent shops. The mirrors are reflecting the greenery and the traffic (red car) down below on the eastern side of the complex. And in Spain, hills in the background. 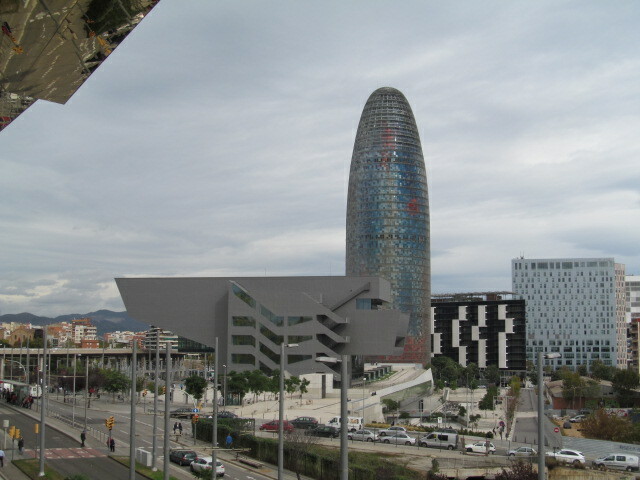 Neighbours of the flea market; the tower is a very modern icon of Barcelona. Its facade or skin clearly gives the impression that it has been painted like a canvas, with dabs of red and other colours here and there. The building in front is separate; likewise the black and white one. The Spanish and their wonderful sense of the visual. 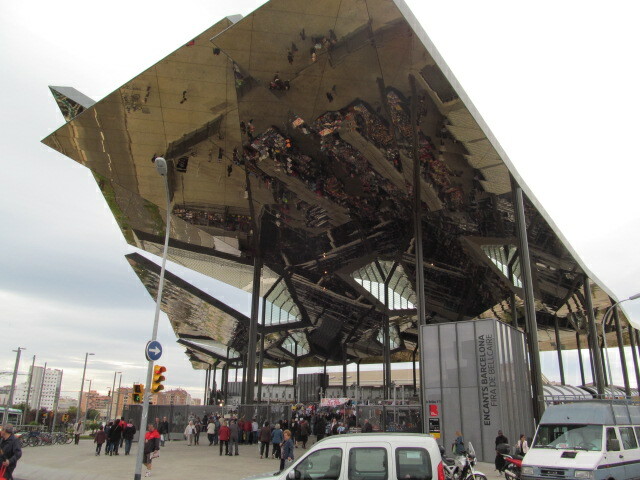 I couldn’t resist one final photo of this extraordinary flea market, extraordinary in its architecture but also in the vision of the city to build infrastructure like this. The vast majority of tourists will never see this. 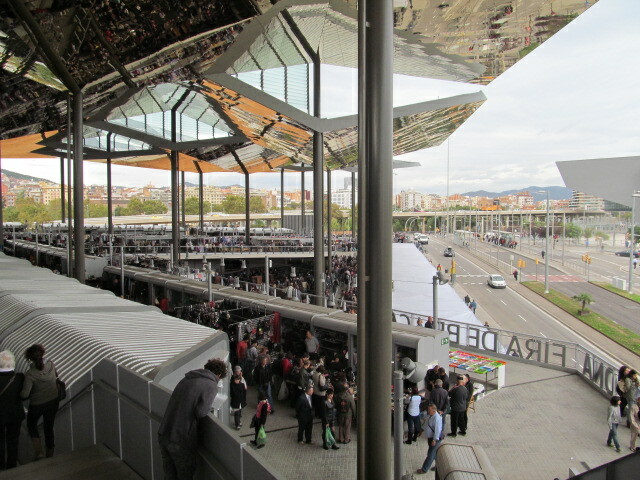 I have not seen it on any list of must things to do in Barcelona. This is for the people of Barcelona and their leaders continue to accept the responsibility to enhance their lives, to create beautiful places in which to live, work and raise their families. 40-50 kilometres of this and so often along avenues like this. I could live here! And you could all come and visit me! This entry was posted in Uncategorized on November 4, 2013 by agnotarte.